← QuiltFest 2011 Birmingham, Alabama Quilt Show. 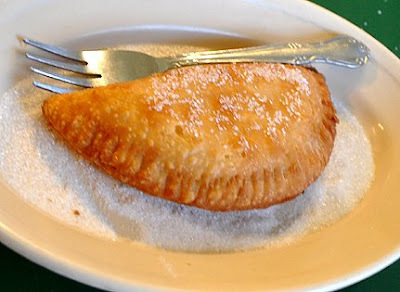 To all of you that are familiar with the wonderful fried pies we get at Homestead Hollow Festival in Springville, AL you need to visit Bloom-N-Pie Days in Blountsville, AL. June 11-12. The Dunn Family, Harold & DeLois are the pie makers at Homestead Hollow. This with be the 8th gathering of this festival at their home. Daylillies in full bloom of all kinds, Hydrangea’s and other beautiful flowers to look at and purchase and of course their wonderful pies. A drawing will be held Saturday, 12:00 noon and Sunday 2:00 pm. Door prizes, Daylillies and Dydrangea’s will be given away. Dunn’s Daylily Garden is a registered display garden. They are open daily June 13th through June 30th. Here is an article in The Blount Countian Newspaper. I hope to see you there. This entry was posted in Entertainment, Main, Plants. Bookmark the permalink. Oh, Fried pies! Chris, you are killing me! It’s 100 degrees and now I am going to have to make some! Cherry and blueberry…. yes, it will be worth the effort! Chris, I just read your post about you and husband’s visit back “home.” Wow! Thanks for sharing that. I live in RI and only hear what’s on the news, and now it’s next to nothing being said. My nickname is Jodi, but my real name is Geraldine, like your MIL. My heart goes out to you and your hubby and the rest of the folks there. We truly are blessed to have our Heavenly Father who has prepared a place for us – His house has many mansions!